Chris Forrester celebrates his goal against Bury. Photo: Joe Dent/theposh.com. Peterborough United captain Chris Forrester hopes a key goal in the 3-1 win over Bury at the ABAX Stadium on Saturday (October 8) will be a sign of better things to come. 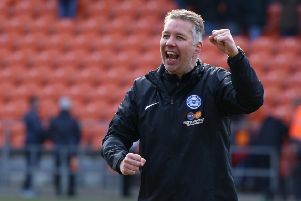 Forrester’s classy equaliser towards the end of the first half was the highest quality moment of a game which saw Posh snap a run of eight competitive matches without a victory. It was his second goal of the season - his first arrived on the opening day of the League One campaign at Rochdale. Chris Forrester scores for Posh against Bury. Photo: Joe Dent/theposh.com. The welcome three points moved Posh up five places to eighth. “The manager is always on at me to score more goals,” Forrester revealed. “He wants me to get more involved high up the pitch. “I’ve now matched my goals tally for the club from last season, but hopefully it won’t be the last goal I score. “Just before I came over here I was scoring goals regularly in Irish football, but I was playing in more advanced positions then. Shaquile Coulthirst joins in Chris Forrester's goal celebrations during the 3-1 win over Bury. Photo: Joe Dent/theposh.com. “I’m told the manager was a goal-scoring midfielder so I don’t suppose he will get off my back just yet and I wouldn’t want it any other way. It’s just one goal and it’s important I don’t rest on my laurels. It was a big win for Posh whose next home game in League One is a local derby against Northampton on Tuesday, October 18. Posh are at Fleetwood this Saturday (October 15). Forrester added: “We showed good character after letting an early goal in against Bury. We didn’t let it bother us. We stuck to our gameplan of being very positive and aggressive in possession and we were rewarded with an excellent win. “We needed that equaliser before half-time and we really kicked on after the break. It was a very good all-round display in the end. “I was happy with the way I played and Bury’s system suited me as it gave me extra space in which to play. Having Leo (Da Silva Lopes) in such great form also helped. When he’s on it he’s some player, but he also works hard. If he keeps this form up, he will have a great career. “The back four kept me on my toes as well and Marcus Maddison really plays well when he can find space. Leading Posh to success this season is one Forrester ambition. Gaining selection to a full Ireland squad is another and man-of-the-match performances live on television will surely help that cause. Forrester has two under 21 friendly caps to his name.